Made from black extruded polypropylene. The trim is either straight or lopped to produce super, looped or leaded Christmas tree culture ropes. Leaded christmas tree culture rope has a similar construction to super Christmas tree except that it has three strands of lead running through the center of the rope has a similar construction to super Christmas tree except that it has three strands of lead running through the center of the ropeto help it sink or hang vertically. Approximate breaking strengths are as follows: 1850kg for super christmas tree rope, and 1500kg for looped and leaded christmas tree rope. Used in the continuous method of mussel growout, as center core rope with cotton mussel socking or as a spat collector. Can also be used in the single dropper method or continuous as a spat collector. 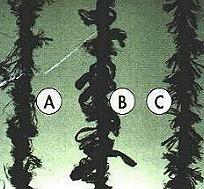 When used as a spat collector in the continuous method, one continuous length of rope hangs from the manline (the backbone of both methods). In the single dropper method, many lengths of rope hang separately from the manline as a spat collector. The Culture ropes are connected to the manline with mussel lashing. When used in mussel growout, the rope is used with cotton socking in the continuous method of mussel growout. The ropes are treated with a UV stabilizer to help protect the rope from wethering. They are designed for a high surface area to length ratio. Leaded christmas tree culture rope has three strands of lead running through the rope to help it sink or hang vertically.